Get precise cooking results you can depend on with this Ancona Elite Gas Cooktop. Constructed with 430 grade stainless steel, it features heavy-duty cast-iron grates and electronic ignition with flame failure safety device. Everyday meals and holiday feasts will be a breeze with this gas cooktop. Consisting of sealed burners, it allows you the ease of boiling, frying or searing on high heat or simmering on low heat, without the worry of food spillage. The individual triple ring burner offers greater surface space and the flexibility to position large pots and pans. The Ancona Elite Gas Cooktop offers style, function and performance, creating an optimal culinary experience. 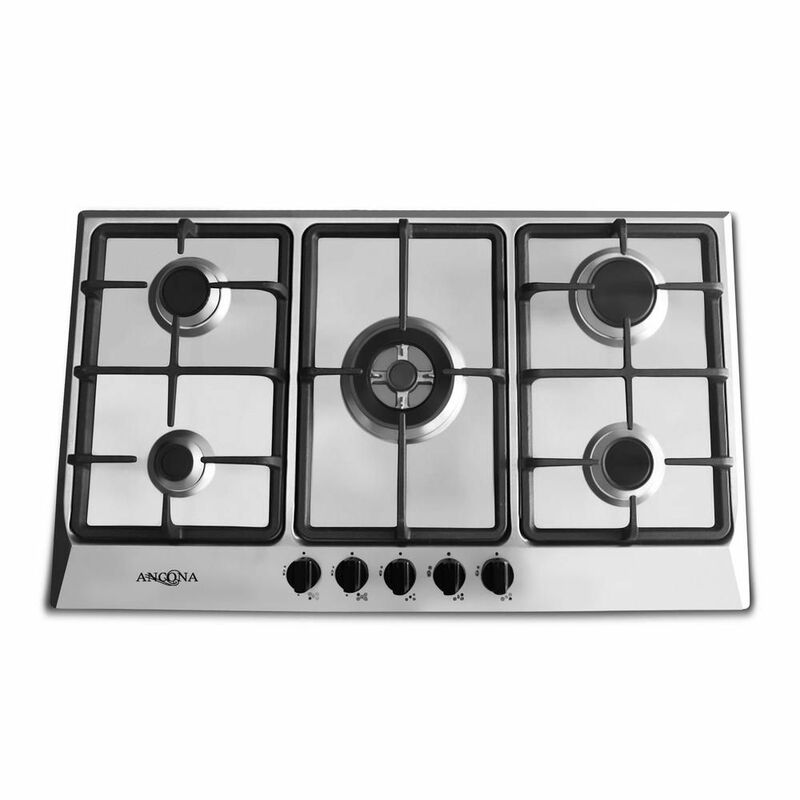 34 inch Gas Cooktop in Stainless Steel with 4 Burners including Triple Ring Brass Power Burner Get precise cooking results you can depend on with this Ancona Elite Gas Cooktop. Constructed with 430 grade stainless steel, it features heavy-duty cast-iron grates and electronic ignition with flame failure safety device. Everyday meals and holiday feasts will be a breeze with this gas cooktop. Consisting of sealed burners, it allows you the ease of boiling, frying or searing on high heat or simmering on low heat, without the worry of food spillage. The individual triple ring burner offers greater surface space and the flexibility to position large pots and pans. The Ancona Elite Gas Cooktop offers style, function and performance, creating an optimal culinary experience. 34 inch Gas Cooktop in Stainless Steel with 4 Burners including Triple Ring Brass Power Burner is rated 4.2 out of 5 by 6. Rated 5 out of 5 by Gerry from The 34 inch cooktop fit perfectly in our cutout which... The 34 inch cooktop fit perfectly in our cutout which was too small for a 36 inch cooktop and too big for a 30 inch cooktop. It was easy to connect to our under counter gas line and works beautifully. The five second ignition delay requires some experience, but it certainly is not a problem. Rated 4 out of 5 by tenntex from This is a nice range top, once installed. I had one serious issue with the items that came with ... This is a nice range top, once installed. I had one serious issue with the items that came with the package, however. The gas regulator valve and the fitting installed on the range top are 1/2" pipe threads. The two pieces would not thread together as delivered. I had to "chase" the threads on both the regulator valve (female connection) and the male connection installed on the range top. Fortunately I had both male and female iron fittings at home, and could do this myself. Ancona should do some quality control checks on the supplied fittings. I have no idea what the outcome would have been if I had this installed by a 3rd party. Rated 5 out of 5 by Lk0808 from Great stove top We got this particular cooktop to replace one of the same size (of which there are not a ton) and were pleasantly surprised. Amazing burners. Perfect heat output and looks great! Rated 1 out of 5 by ILONA from THE PART OF THIS COOKTOP ARE NOT STAINLESS STEEL, BUT ALUMINUM. GETS STAINED AND UNABLE TO CLEAN ... THE PART OF THIS COOKTOP ARE NOT STAINLESS STEEL, BUT ALUMINUM. GETS STAINED AND UNABLE TO CLEAN IT OFF, UNLESS YOU WILL DAMAGE THE PARTS. IN THE INSTRUCTION BOOKLET TELLS YOU TO USE SOAP AND WATER, BUT THE OVER FLOW LIQUID WILL BURN ON THE ALUMINUM AND IMPOSSIBLE TO CLEAN IT OFF. THIS A "LEMON" DO NOT BUY IT. UNFORTUNATELY I DID AND LEARNED THE HARD WAY. HERE I AM WITH THE WEEK OLD USED 1 TIME UNIT, ALREADY DAMAGED. SOAP AND WATER DID NOT WORK. Rated 5 out of 5 by LightningRocks from Love this cooktop I replaced a 30" GE cooktop with this 34" cooktop. I had to make a couple small modifications to the hole size but the difference was maybe an inch and a half which amounts to three quarters inch on each side. It was well worth the effort. The amount of extra room was amazing. The best part of my upgrade is the time saved by the much more efficient burners of this unit. I am really liking the high btu burner for "turbocharged " heating of large pots. It is also going to allow me to make real stir fry! I purchased the unit with the large burner centered to allow for really large pots. VERY happy with my purchase. Easy to install but I do own an HVAC company and am experienced at the skills needed. Rated 5 out of 5 by Rich from Product was delivered in excellent condition, I was impressed with the spare parts for the burners. Product was delivered in excellent condition, I was impressed with the spare parts for the burners.